Black Cat Appreciation Day is August 17. This is the day we celebrate, what else? The beautiful and mysterious creature known as the black cat. We love all cats at CLO, of course, but having a special day devoted to black kitties is OK by me. So let's celebrate. Below is a list of things to do to celebrate this day. 1. To get yourself in a celebratory mood, feel free to enjoy these pictures of awesome black cats from our readers. 2. While you're at it, go ahead and post your cat's picture (black or not) to our Facebook page. 4. Post about this special day on social media. Don't forget to use hashtags, like #blackcatappreciationday and #catloversonly in your posts. 5. Write a Web page or blog post on your cat blog or pet website about it. Don't have a pet related website yet? Click here to learn how to start a website or blog based on your passion for your pets. I mutilated that line from The Dark Knight just for fun, but you have to wonder why black cats figure in superstitions in many countries and cultures. In some cultures, black kitties are thought to be good luck. In other societies, the black cat brings bad fortune. Go figure. The reality is that all cats are good luck, but you knew that already and don't believe any of that superstitious mumbo jumbo. Speaking of superstitions, the belief that a black cat crossing your path is bad luck probably comes from outdated beliefs about witches and animal familiars. To that I say, give your beautiful black cat a witchy sounding name! On that note, check out these ideas for black cat names, and have a look at these myths and facts about black cats. 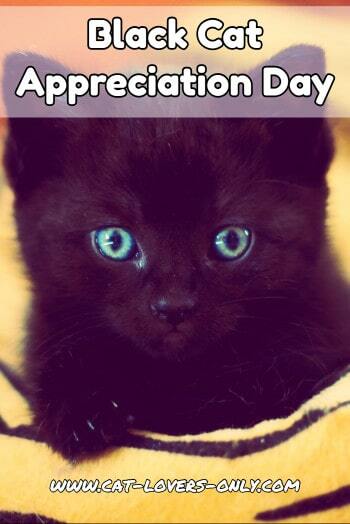 Click "Save" to celebrate Black Cat Appreciation Day and save this post for later on Pinterest.